Hello all, been lurking this forum for sometime now. Obviously a great source of information and suggestions, so figured I would make my introduction so that I can get to picking some of your brains about my build and other related questions. A few weeks ago, my girlfriend and I picked up this 93 E350 bus. has 25 thousand on the odo, and while not perfect by a strech, seems to be mechanically sound (vouched by mechanic friend). has the 7.5 gas motor. I know that this age vechicle can be cause for concern with such low miles, and inactivity, but the non profit I bought it from seems to have been pretty good with regular mantience and seeing about it at their local shop. The reason they sold it was due to the backdoor being damaged, and not being able to get it certified for transporting children, so they decided to sell and purchase something newer. Since it's been in our possession, I have ripped out all the seats, wood siding, and made a makeshift repair on the backdoor (That I will be returning to later on) and have started learning sketchup and playing with floor plan possibilities. 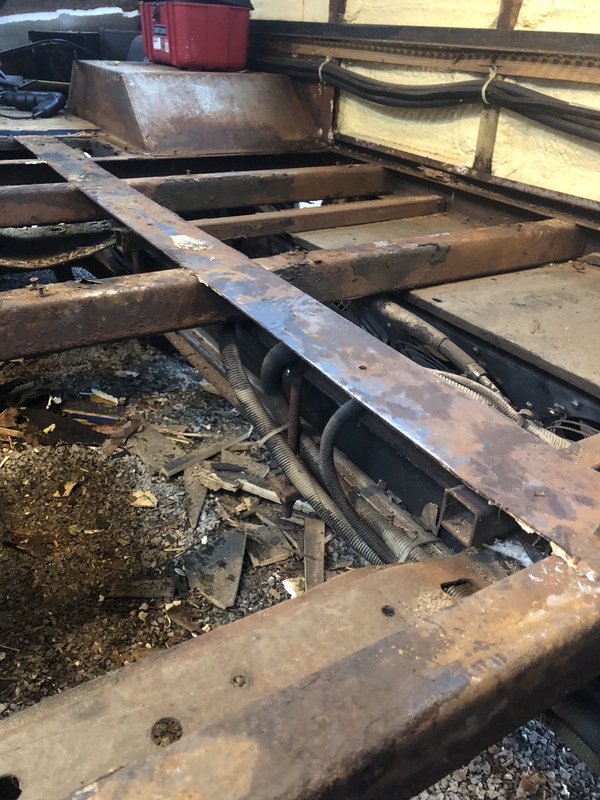 The plywood floor needs to (mostly) be replaced, and upon inspection I have noticed that my bus does not have the metal floor underneath which seems to be more of the norm for most builds I have seen, so I am looking into how that will affect my build/insulation process. A year before selling, they paid to have some type of rain/weather proofing put on the roof of the bus, but I am still experincing some minor leaking, so that is one of my first goals before I get too ahead of myself framing anything out. I have a ton of questions that I would greatly appreciate input on. But for now here are some pictures of my current progress. While I would like to see steady progress, I don't want to rush the build or have to do any short sighted backtracking. Sorry if this thread is sort of a jumbled rambling, it's 4am and the questions I need to ask aren't quick to come to mind. Thanks for having such a great resourceful community. Look forward to partcipating in the discussions of the forum. How does one wear out a 24 year old bus by putting barely 1000 miles a year on one. I'd be concerned if that mileage is correct. plywood floor looks wet...like old consistent wet...sitting outside not moving for 20 years?...flood?...if wet, it's perfect for easy removal...concern would be rust on the under carriage...otherwise she looks like a nice ride...have fun. Sorry im not sure what you mean by wear out? While the bus does have signs of wear, it seems pretty sound considering the age. All the information that has been presented to me on the bus backs up the ODO as correct. I did not get the impression anything was afoul. The bus runs great, shifts great, good compression etc. The bus seems to be primarily used to shuffle kids around a small KY town. The 1st owner was a hotel that used it in similar ways. I think the mileage is legitimate. plywood floor looks wet...like old consistent wet...sitting outside not moving for 20 years?...flood?...if wet, it's perfect for easy removal...concern would be rust on the undercarriage...otherwise she looks like a nice ride...have fun. I will say that the picture I posted was the worst example of the floor damage. It's placed right under where the most prevalent leak is located. The rear of the bus isn't near as bad but I am planning on replacing it all. There is surface rust on the undercarriage, but nothing that is a huge cause of concern at the moment. A 99 Silverado I had until recently showed much more signs of rust damage than this bus. 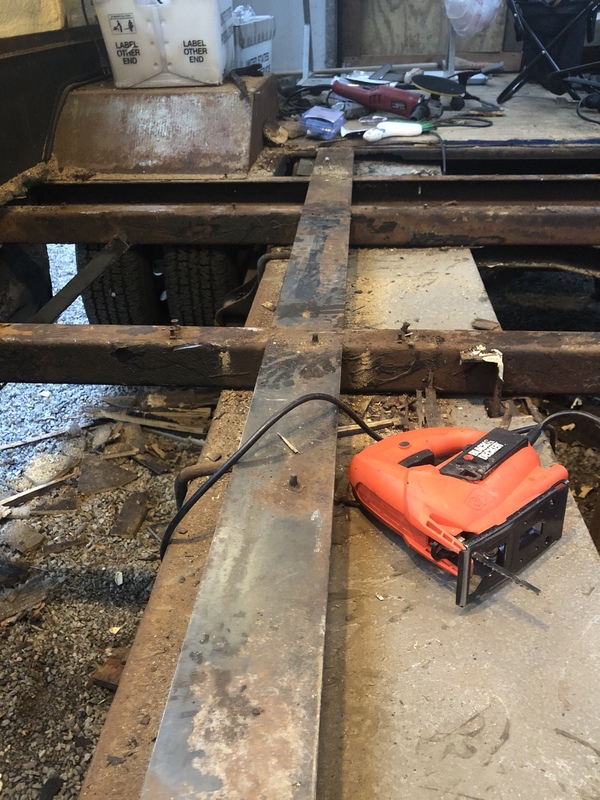 I am also planning on removing as much undercarriage rust as possible using a sander. Most of the frame sanding I have done thus far has removed rust easy than anticipated. I only paid $1600 for the bus, and I have been pleasantly surprised with the condition that it currently is in. With it only having the plywood layer of flooring, I was looking for input on rather using some sort of sheet metal to create a layer to place insulation between the underbelly and the plywood flooring would be a good idea? I can only reccomend marine grade plywood at least the thickness if not more than what you are pulling up. Don't remember the name or brand but they also make plywood that has a layer of BISQUINE or layer of tar and rubber coating you can face down and tape the seams as you lay the cuts down. Thank you for the suggestions Jolly, that sounds like it may be the way to go. I will start looking into that tonight. Also, does anyone know if hitches and other things that fit this year E350 is somewhat compaitable with the bus? It left ford as an "RV prep pkg" so im confused on if I would run into issues when attempting to use parts for the e350 ecoline and such. Probably the same chassis with beefier springs but a standard hitch should fit and there should already be bolt holes. Anything E or F 350 should fit. Sorry im not sure what you mean by wear out? While the bus does have signs of wear, it seems pretty sound considering the age. I may have been extreme in my description of "while not perfect by a strech"
Hey everyone, making some progress on the tear out. At this point I'm probably going to do the first section I already have pulled out before moving to the back. Working on cleaning up the rails and getting the rust off, going well so far as its only surface rust and goop left over from adhesive. After im done with that I'm planning on figuring out my floor insulation. My current plan (would love input) is to a fix sheet metal along the rails, and creating a layer to put my insulation in, underneath the plywood. Does this seem like an effective way to proceed? If so, would I be better off with rigid foam or a spray in? Also worth mentioning I plan on another rigid layer above the plywood before the final flooring. Thanks for all the input so far and in the future! Sheet metal under those ribs, fill the voids with sprayfoam and sheet over with ply.